I was recently in Germany for a family event in Munich, Bavaria. In Germany, stores are closed on Sundays and they start to shut down around 3 or 4 pm on Saturdays. My train arrived at 3.30 pm in Munich, which gave me a very short window for an important mission besides attending the family event: I wanted to check out Noh Nee, a store owned by the two Cameroonian sisters Marie and Rahmée, that sells Dirndl with an African twist. In case you don’t know what a Dirndl is: it’s a traditional dress worn in Bavaria as well as Austria, inspired by the clothing of Alps peasants. So as an Afro German, it’s something I wouldn’t be caught dead in, as it used to represent everything I didn’t identify with – a kind of traditional, conservative, “Germanness”. But here I was suddenly leaving messages on a voicemail and asking the store owner of Noh Nee, if she could keep her store a bit longer open, so that I could come by and check it out. My sister came along reluctantly and mentioned several times that she wasn’t intending to buy anything. I ensured her that I just wanted to have a look and take some pics for the blog :-). What can I say, we ended up doing more than just having a quick peek. We met one of the owners – Rahmée – who was super nice and welcoming. She showed us around the store and told us the inspiration for different designs, where the collections were made and how much work went into each design. We had a blast, tried on shoes, Dirndl, coats, accessories and talked about everything under the sun and what’s hot and not in the African Fashion industry. What makes the “Dirndl à l’Africaine” so special and unique for me is that it combines both of my heritages in an excellent and stylish way. The secret about a Dirndl: it looks awesome on any body type. It accentuates the waist and highlights the chest. The dresses from Noh Nee are not cheap, but therefore they are exceptionally well made. Everything is just a real design piece. Rahmée and her sister Marie make sure that the fabrics are high quality and use besides prints from Vlisco also fabrics that originate from Ghana, Senegal etc. 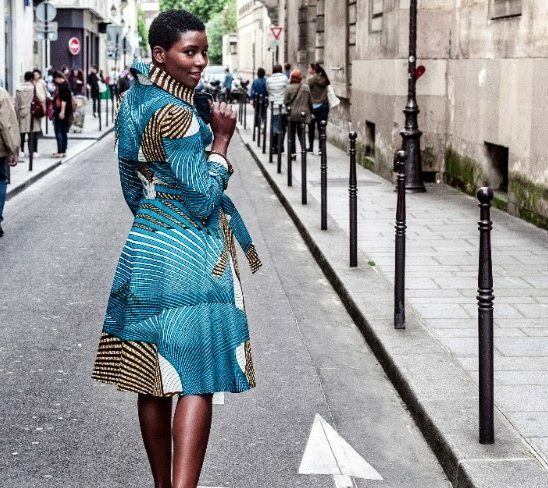 The brand also works together with Senegalese artist and textile designer Aissa Dione. And of course, I ended up buying a Dirndl! It has already become a timeless staple in my wardrobe. My sister bought a coat and several accessories. We arrived very late for the family dinner, but it was totally worth it! Go check out Noh Nee when you are in Munich or visit their online store. Comment below and let me know how you like this combination of German tradition and African fabrics!